Be cliché because be yourself! She wants to experience all the lives of all the others. She joins in on their hysterical crazes and tries to blend her mind with their outrageous ideas. She does the research to make sure she understands them and can keep up. She sometimes dives in too deep, and what for others was casual leisure, becomes now an obsession for her. That’s when she moves on to another group. One where she can fit more of herself in, one where she feels more parts of her reflected and understood. I wish someone would tell her, it’s not necessary at all, what you are doing. You don’t have to conform to be able to be liked. You don’t have to try so hard to be still so unheard. You don’t have to sell your soul to open up your heart. You don’t have to be liked to be loved by people who matter. And what would you rather be, liked or loved? Disposable or invaluable? The most important thing is to be aware of yourself and what you have to offer them. Don’t downplay yourself, be real and be honest. What do you see reflected in people’s faces when you’re with them? What compliments do they give that you got so accustomed to nonchalantly brush off? What do you like most about others? Chances are, that’s what you like most about yourself, only you have trouble seeing it in yourself, so you seek the reflection of it in others. Go and experience your own life. Explore your own desires and weave your own dreams. Follow them, or write about them, paint them or just tell them to others. Inspire and have hope. Always have hope. Love and despair from time to time, but not all the time (no, not even love). Create and let loose. Suffocate yourself in breathing new things and drown yourself by swimming new depths. Be proud, be silly, be passionate, be noisy and obnoxious, be humble and forgiving. Be thankful and be aware. 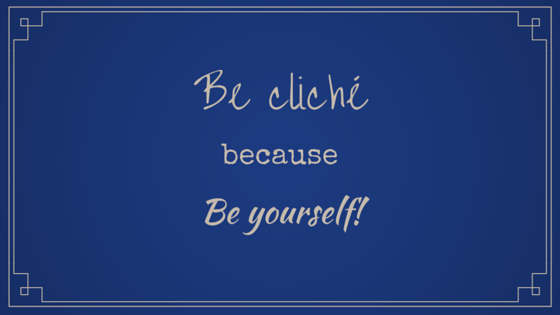 Be cliché because be yourself!